Major cities in sub-Saharan Africa, just like the jam-packed cities of China and India, are battling severe traffic congestion as the demand for modern transport increases. According to research by the Stockholm Environment Institute (SEI), mounting gridlock in this growing part of the world is creating health and safety risks, impeding economic development and making an accelerating contribution to climate change despite Africa's historically small carbon footprint. In a recently released policy brief, SEI identified severe congestion issues in five sub-Saharan countries: South Africa, Uganda, Tanzania, Zambia and Zimbabwe. 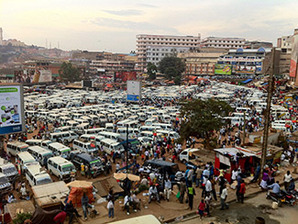 A taxi terminal in Kampala, Uganda. Photo by Rachel Strohm, courtesy of Flickr. "The capital cities there are growing enormously, and everyone is aspiring to a typical Western lifestyle, and that means having a motorcar," said Howard Cambridge, a research associate at SEI. "As the cities are developing, they're not building the infrastructure to cater to all these cars," Cambridge added. "The way the cities have grown, the arterial routes into cities are getting clogged up with motor vehicles, with public buses, with lorries, coupled with nonmotorized forms of transportation, as well. You've got people on bicycles, rickshaws, mopeds, all going along main arterial routes, causing bottlenecks." According to Cambridge, the transportation system in sub-Saharan Africa isn't designed to accommodate the current number of road vehicles, let alone future growth. In addition, public transit systems in sub-Saharan Africa are not robust enough to help ease demand. "It's getting to the point where traffic congestion is so bad it's impeding economic development," said Harry Vallack, an SEI research associate. He added that it's also increasing inequality as people outside the city struggle to commute in for work. Another significant issue is road safety. Over the last two decades, as more and more vehicles have crammed onto the roads, the number of traffic deaths in Africa has nearly tripled. In the next 10 years, road deaths will become the fifth most common cause of death on the continent, overtaking HIV and malaria, Cambridge said. Air pollution from transportation is also putting lives at risk. Urban air pollution is responsible for an estimated 49,100 premature deaths each year in sub-Saharan Africa. Burning fossil fuels in motor vehicles is one of the main contributors to urban smog, although it's not currently known exactly how many deaths are attributable to transportation alone. Traffic congestion, combined with the fact that vehicles in Africa tend to be poorly maintained older models, further increases the local air pollution issue, Vallack said. Most vehicles in Africa are used cars imported from Europe, where they no longer meet emissions standards. Also, while U.S. EPA aims to reduce the sulfur content of U.S. fuels from 30 parts per million to 10 ppm by 2017, no country in sub-Saharan Africa currently has sulfur content under 50 ppm. In some countries, it's above 5,000 ppm. With sulfur levels so high, modern pollution control systems aimed at reducing particulate emissions from vehicles fail to work and actually have to be removed. "The emissions standards might be bad enough, but by the time they've converted [the vehicles] to work in these countries, the emissions are very bad indeed," Vallack said. Those emissions also contribute to global warming. Africa has made the smallest contribution to global greenhouse gas emissions of any continent. But as African countries develop and use more fossil fuels, emissions are rising. "Although Africa's proportional contribution globally is small, the steep growth trajectory up to 2050 is a cause for concern and a strong stimulus for the development of transport policies and interventions that can deliver economic and social progress at a much reduced level of CO2 emissions," according to an SEI report released last fall. More roads? More cars? Or better policy? At the same time, Africa is especially vulnerable to the impacts of climate change. More frequent droughts, floods and other extreme weather events will reduce agricultural production, worsen food security, spread disease and increase the risk of conflict over scarce land and water resources. In this context, experts say it's essential to promote policies that reduce greenhouse gas emissions from sub-Saharan Africa's transportation sector while addressing the continent's development needs. "Everybody has an interest in an efficient transport system, but sometimes [policies] seem to be skewed toward the personal motor vehicle side of things rather than looking at a more holistic transportation system that's going to benefit everybody," Vallack said. "It's about thinking of things in a more integrated way, thinking to the future. It's not just about building another road because we've got more vehicles than we used to have." At the U.N. Conference on Sustainable Development in Rio de Janeiro last year, transportation was identified as an important issue to consider as part of the Sustainable Development Goals to replace the Millennium Development Goals in 2015. An international effort is underway to explore whether transportation should be included in a set of goals related to energy and water or stand as a set of goals all its own. An integrated and efficient transportation system, if designed correctly, could lead to greater prosperity by providing access to things like water, food and education. "Transport is a driver of development; that is why it's so significant. It feeds into lots of different areas," Cambridge said. SEI will hold a policy dialogue with 20 African countries this month at the U.N. offices in Nairobi, Kenya, to try and produce an official statement recognizing the need for more work in the area of transportation. This is just one of the first steps in tackling Africa's gridlock issues. "There are lots of things that really need to be done, and we're just at the start of it," Cambridge said.